Under the Soul Mates Project banner of "collaborations that never were," Amerigo Gazaway’s latest imagines a recording session between Blues great, BB King, and Texas rap legends, UGK. 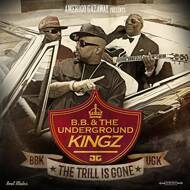 Aptly titled “BB & The Underground Kingz: The Trill is Gone,” the producer seamlessly bridges the gap between hip-hop and its predecessor, the blues. Crafting the album's bedrock from deconstructed samples of King's electric blues hits, Gazaway re-imagined what might have happened had King and UGK actually recorded in the same time and space. Tapping UGK historian and documentary film maker, Sama'an Ashrawi, for unreleased interview audio, the producer cleverly uses the soundbites to help build his project's narrative. Strategically looping and lacing Lucille's guitar licks and B.B. 's road tales with Bun B & Pimp C's southern fried storytelling, Gazaway finds a sweet spot in the overlapping themes of his subjects' respective catalogs.